This is a two bedroom one bath cabin and fully furnished with Bobby McAlpine inspiration. It is only 25 minutes from Auburn so is an ideal location for football fans to stay. It has a waterfront beach area, private pier, seadoo docks and a floating dock that floats nearly year round. It is located in a very popular area but is secluded and located in a cove with little boat traffic. You will have spectacular lake views whether lakeside, on the deck grilling or relaxing on the screened porch complete with a hammock, swinging bed, and futon. The master bedroom has a king size bed and the guest room has two bunk beds. Additionally, during the warmer months the screened porch is popular with the kids for sleeping. The Cabin comes with all you should need including, bath towels, bed linens, dishes, utensils, microwave, dishwasher and washer/dryer. There is a public boat ramp less than a mile from the cabin. The cabin is located in the Blue Creek area of Lake Martin near Chucks Marina. Paddle board, pontoon boat and other Lake amenities are available for rent at Chuck's Marina, Blue Creek Marina or the Ridge Marina. Lake Martin is a very popular Lake location known for its fishing, watersports and relaxation. One bathroom with shower and tub combo. 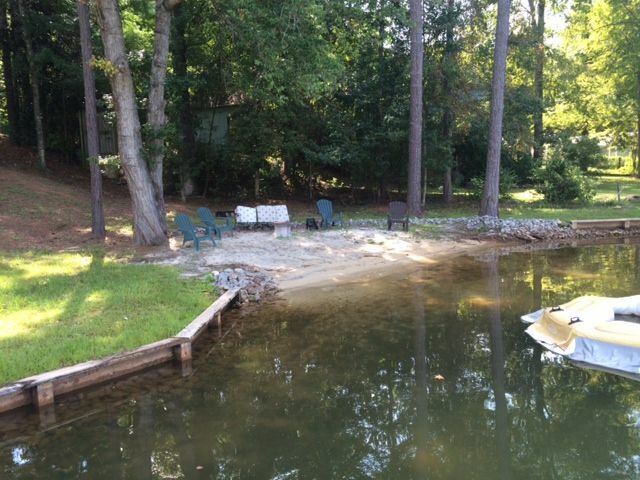 Small beach and 150 feet of waterfront with private pier, floating dock and two seadoo ports. Fire wood available for additional charge. Table seats six very comfortably. Screen porch and Deck overlooking the lake. Monthly rates are only available during the off-peak season. Great house and location. Everything super clean. A perfect place to relax!!! Very simple and very nice. Perfect for our stay. Great location. Easy to back your boat up to house to charge battery on boat. Great view of lake. Screened in porch was awesome. Very clean. Owner very helpful. Great place to spend a fishing vacation. Nice cabin and beautiful view. Cabin updated and nice pier for boat. AU Home Game rates (After Sept): $300.00 2 nights, $375.00 3 nights. No long term rentals during the peak season, monthly rates are available for off-peak. Terms & policies per Rental Agreement. Deposit, cleaning fee, signed agreement to reserve your dates. Monthly rates available.